Moth Whisperer | Small, but valuable. I somehow forgot that my visiting friend is irresistible to all animals. I guess I didn’t forget that general fact so much as I forgot how often it comes into play. My dog is absolutely in love with her, which was expected, and she got a gorgeous moth to land on her last night as we were walking into the house from the airport. The moth must have really liked her, because it then landed on the door and stayed until I left for work this morning. I’m ignoring the possibility that it’s dead, what with a forty-eight-hour lifespan and all. And someday I’ll start using my actual camera instead of my phone camera. 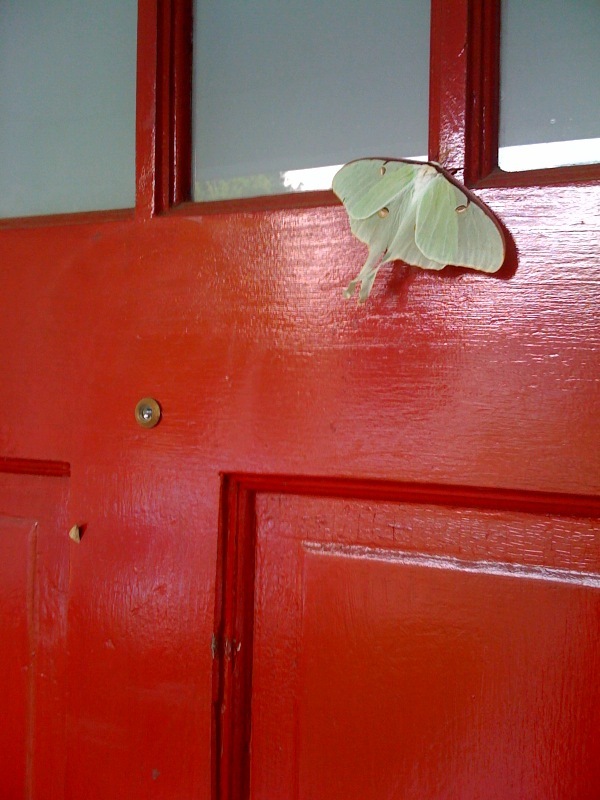 Until then, you get the general idea–bright red door, cool green moth. I’m hoping that Bambi might have wandered into my yard by the time I get home.